Just about anything can happen week-to-week in the NFL, and as this young season continues to evolve, we continue to see standout performances from both fresh and familiar faces around the league. Sunday brought another action-packed slate of games, highlighted by the NFL’s largest upset in 23 years, led by a hungry Buffalo defense carrying a rookie quarterback who was making his first road start. Without further ado, let’s focus on some top defensive performances from Sunday. The Falcons couldn’t come out with the win against New Orleans Saints on Sunday, but Matt Ryan turned in an excellent performance nonetheless. Ryan completed 24 of 26 pass attempts for 281 yards and four touchdowns when kept clean against the Saints. He also connected on three of four deep attempts for 151 yards and two touchdowns. The primary beneficiary of Ryan’s big day was Calvin Ridley. Ryan looked Ridley’s way eight times, which generated seven receptions for 146 yards, three touchdowns and a perfect passer rating of 158.3. Ridley picked up those 146 receiving yards on just 29 routes and averaged a whopping 5.03 yards per route run, which ranked second among all wide receivers with at least five targets on Sunday. Marshawn Lynch’s stat line doesn’t look overly impressive at first glance with just 19 carries for 64 yards – but he was in Beast Mode form on Sunday. Lynch forced seven missed tackles on his 19 attempts (tied for the most among all running backs in Week 3), and he averaged an impressive 3.47 yards after contact per attempt (7th among 32 running backs with at least eight attempts). After a rough start to the season, the Lions first-round selection appeared to settle in against the New England Patriots. Frank Ragnow was a force in the run game, finishing a 75.5 run blocking grade. He also went 37 pass-blocking snaps without allowing a pressure after allowing 13 pressures in the first two games. The Rams picked up another double-digit win in the Battle for Los Angeles, and Jared Goff was right at the center of it. Goff notched an adjusted completion percentage of 88.2 percent, which ranked third among all quarterbacks in Week 3. He was only under pressure on 4 of his 38 dropbacks, but even that couldn’t slow him down as he delivered a perfect passer rating of 158.3 under pressure. One of the men keeping Goff clean against the Los Angeles Chargers pass-rush was right guard Austin Blythe. 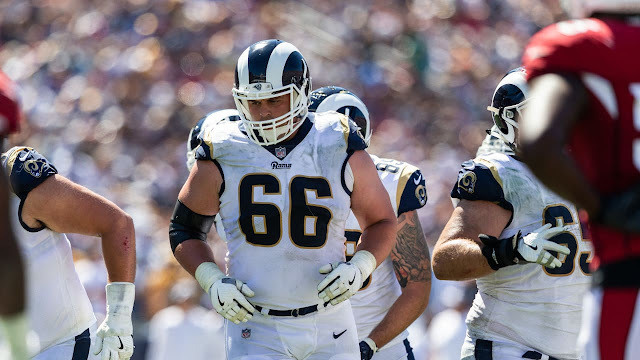 Blythe did not surrender a single pressure in 38 pass-blocking snaps and was one of three Rams offensive linemen to accomplish that feat. He was also very effective in opening lanes for Todd Gurley, recording a run blocking grade of 77.2. The Giants offense put forth its best performance of the season on Sunday, and so did their star wide receiver. On just 12 routes run from the slot, OBJ turned in 5 receptions for 67 yards and averaged a staggering 5.58 yards per route run from the slot, which ranked first among all wide receivers in Week 3. Panthers running back Christian McCaffrey burst out for 184 rushing yards on Sunday, and leading the way for him was right tackle Taylor Moton. Moton’s run blocking grade of 81.1 ranked second among tackles in Week 3, and he also kept a perfect slate on his 27 pass-blocking snaps. After a strong Week 1 showing and a dreadful Week 2 performance, Joe Flacco delivered his best game of the season for the Ravens against the Denver Broncos in Week 3. Flacco got the ball out quickly with an average time to throw of 2.36 seconds which was third-lowest among quarterbacks Sunday. He also successfully pushed the ball downfield, as he recorded 73 yards from deep passes, which was the sixth-best mark among quarterbacks in Week 3. Chiefs quarterback Patrick Mahomes added to his touchdown total against the San Francisco 49ers and one of the key men keeping him upright was Mitchell Schwartz. Schwartz allowed just one hurry in 41 pass-blocking snaps, and he has now allowed only three pressures in three games played this season.